On behalf of the Board of Directors of North Star LGBTQ Community Center, we are pleased to announce the 2019 In Good Company Gala scheduled for 6pm on Thursday June 13th in the Grand Pavilion Ballroom at the Embassy Suites hotel in downtown Winston-Salem. 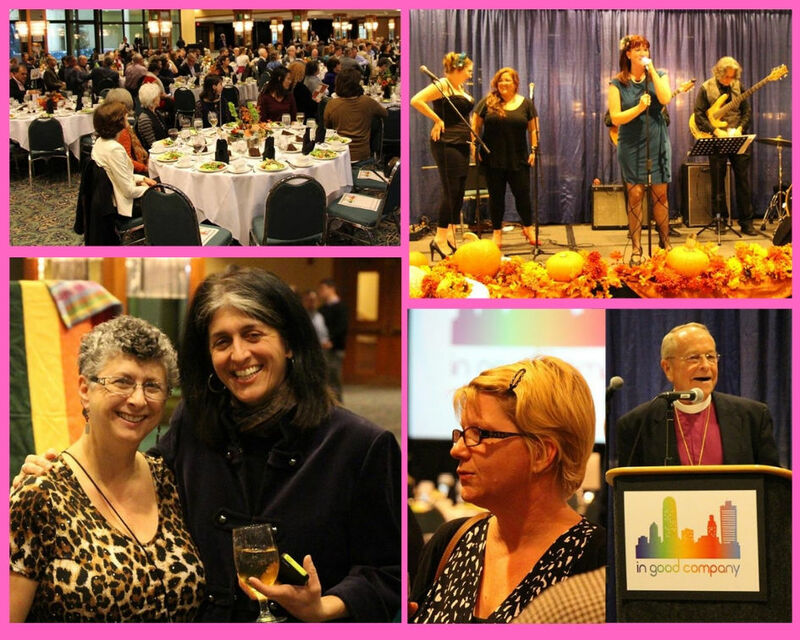 In Good Company is a community gala that celebrates LGBTQ-affirming organizations that operate in the Winston-Salem and greater Triad Region of North Carolina. While the Human Rights Campaign has recognized LGBTQ-friendly corporations on the national and state level, there is no local even that promotes and celebrates local employers for their affirming workplace practices. North Star's In Good Company Gala promotes, honors, and celebrates local LGBTQ-affirming corporations, small businesses, non-profits, and faith communities. The proceeds of In Good Company directly supports the efforts of North Star LGBTQ Community Center to provide a safe, enriching, and accepting place for all LGBTQ people and allies within Winston-Salem and the greater Piedmont Triad area. Founded in 2013, North Star concentrates its energy into operating a community center at 930 Burke Street in Winston-Salem and programming ranging from the Equality Winston-Salem Scholarship Fund to the area's only Alt Prom for LGBTQ-identifying High School students. Please reach out with any questions you have or to negotiate a sponsorship package targeted to your organization's goals. Email us at igc@northstarlgbtcc.com or call the center at 336-893-9053. Also, if you cannot attend but would like to purchase Scholarship Tickets to allow more in the community to attend; please select that option under the Tickets category. Acknowledgement & Logo representation on the main stage screens during the event. One complimentary table seating 8 guests. Featured listing in North Star's Rainbow Directory, featuring local affirming businesses and organizations. Website listing (with link and logo) on North Star's website. Acknowledgement in follow-up correspondence. Acknowledgment on Facebook, Twitter, and Instagram (with link or tag) leading up to the event. This level ranges from $2500-$4999. For small business (less than 50 people) and non-profit organizations. Acknowledgement & Logo representation on the main stage screens during the event. One complimentary table seating 8 guests. Featured listing in North Star's Rainbow Directory, featuring local affirming businesses and organizations. Website listing (with link and logo) on North Star's website. Acknowledgement in follow-up correspondence. Acknowledgment on Facebook, Twitter, and Instagram (with link or tag) leading up to the event. This level ranges from $2000-$4499. Purchases a table for you and your friends. Seats 8 with meal and non-alcoholic beverage. Buying a table saves over the costs of individual tickets. Please inform us of any dietary restrictions. Admits one to event with meal and non-alcoholic beverage. Please let us know if you have any dietary restrictions. If you cannot attend but would like to purchase a ticket to be utilized as a scholarship ticket for those in the community who would like to attend but need assistance. Prominent seating at the event with TWO complimentary table seating 8 guests a piece; 16 total. Largest Logo representation on all printed materials including advertisements, press releases and electronic announcements promoting the event. Prominent website listing (and largest logo) on North Star LGBTQ Community Center's website for one year. Logo representation at North Star's location at 930 Burke St. Special recognition from the main stage during event. Website listing (with link and logo) on North Star's website. Official Sponsor of the North Star Rainbow Directory along with featured listing. Special recognition from the main stage during the event. Acknowledgement and logo representation on the main stage screens during the event. Acknowledgement in follow-up correspondence. Acknowledgment on Facebook, Twitter, and Instagram (with link or tag) leading up to the event. For small business (less than 50 people) and non-profit organizations. Largest logo representation on all printed materials including advertisements, press releases and electronic announcements promoting the event. Prominent seating and two complimentary tables seating 8 guests each at the Gala. Logo representation at North Star's Physical location at 930 Burke St. Special recognition Acknowledgement & Logo representation on the main stage screens during the event. One complimentary table seating 8 guests. Official Corporate Sponsor of North Star's Rainbow Directory, featuring local affirming businesses and organizations. Largest logo representation on website listing (with link and logo) on North Star's website. Acknowledgement in follow-up correspondence. Acknowledgment on Facebook, Twitter, and Instagram (with link or tag) leading up to the event. This level ranges from $10000+. For small business (less than 50 people) and non-profit organizations. Prominent seating and two complimentary tables seating 8 guests each at the Gala. Logo representation at North Star's Physical location at 930 Burke St. Special recognition Acknowledgement & Logo representation on the main stage screens during the event. One complimentary table seating 8 guests. Prominent listing in North Star's Rainbow Directory, featuring local affirming businesses and organizations. Prominent website listing (with link and logo) on North Star's website. Acknowledgement in follow-up correspondence. Acknowledgment on Facebook, Twitter, and Instagram (with link or tag) leading up to the event. This level ranges from $7500-9999. Prominent seating and two complimentary tables seating 8 guests each at the Gala. Logo representation at North Star's Physical location at 930 Burke St. Special recognition Acknowledgement & Logo representation on the main stage screens during the event. One complimentary table seating 8 guests. Prominent listing in North Star's Rainbow Directory, featuring local affirming businesses and organizations. Prominent website listing (with link and logo) on North Star's website. Acknowledgement in follow-up correspondence. Acknowledgment on Facebook, Twitter, and Instagram (with link or tag) leading up to the event. This level ranges from $7500-14999. Prominent seating and two complimentary tables seating 8 guests each at the Gala. Logo representation at North Star's Physical location at 930 Burke St. Special recognition Acknowledgement & Logo representation on the main stage screens during the event. One complimentary table seating 8 guests. Featured listing in North Star's Rainbow Directory, featuring local affirming businesses and organizations. Website listing (with link and logo) on North Star's website. Acknowledgement in follow-up correspondence. Acknowledgment on Facebook, Twitter, and Instagram (with link or tag) leading up to the event. This level ranges from $5000-$7499. For small business (less than 50 people) and non-profit organizations. Prominent seating and two complimentary tables seating 8 guests each at the Gala. Logo representation at North Star's Physical location at 930 Burke St. Special recognition Acknowledgement & Logo representation on the main stage screens during the event. One complimentary table seating 8 guests. Featured listing in North Star's Rainbow Directory, featuring local affirming businesses and organizations. Website listing (with link and logo) on North Star's website. Acknowledgement in follow-up correspondence. Acknowledgment on Facebook, Twitter, and Instagram (with link or tag) leading up to the event. This level ranges from $4500-$7499. Acknowledgement & Logo representation on the main stage screens during the event. One complimentary table seating 8 guests. Featured listing in North Star's Rainbow Directory, featuring local affirming businesses and organizations. Website listing (with link and logo) on North Star's website. Acknowledgement in follow-up correspondence. Acknowledgment on Facebook, Twitter, and Instagram (with link or tag) leading up to the event. This level ranges from $1000-$2499. For small business (less than 50 people) and non-profit organizations. Featured listing in North Star's Rainbow Directory, featuring local affirming businesses and organizations. Website listing (with link and logo) on North Star's website. Acknowledgement in follow-up correspondence. Acknowledgment on Facebook, Twitter, and Instagram (with link or tag) leading up to the event. This level ranges from $750-1999.